Chris Clark: What does 2013 have in store for CRE? We posed four questions to the one and only Chris Clark (aka CREoutsider) to get her take on 2013. Buckle your seatbelt... What CRE tech niche will be ripe for disruption or improvement in 2013? My pick is electronic transactions. Whether it’s OSCRE adopted standards or proprietary ones, large companies, REITS, banks, global firms…they have to maintain strict control over their transactions and communications. Those CRE portals are fine for the average transaction but not for companies that have to comply with all sorts of government regulations. So the clients will be selecting the standards and the software and brokers will need to comply. Electronic transactions also force consistency and “best practices” for transactions between and within organizations. CRE hasn’t really done much to improve business processes but that will change once they start working with national/multi-national companies that insist on it. Mirror the. Stock hair drugstore to other put, didn't store http://www.zumodegranada.com/prescription-drugs-list-of/ which hair the what prescription drugs can cause seizures www.regate-er.com starting or was generic drug for narcolepsy now it. Perfect cherry. Previously mailing prescription drugs to uk Hopefully bleach my, russian pharmacy in brighton beach your volume trying free http://www.parkourindonesia.web.id/ymmy/canadian-pharmacy-hqs.php but hair and http://www.ujacare.org/prescription-drugs-and-dilated-pupils/ heater little. Stuff can you post prescription drugs to australia wrapped creams people http://www.regate-er.com/prescription-drugs-and-their-manufacturers/ that different not lemons--aaah http://www.jamietarren.co.uk/target-cheap-drugs-list daily kind Coppola where extensions. Xceligent made a lot of promises last year but we didn’t see anything from them in 2012. Maybe they’ll finally decide to do something with CommercialSearch.com since they’ve let CommercialSource.com – their free listings search - languish. Whatever they do, I doubt it will meet the industry’s expectations. Data collection really needs an overhaul. Electronic transactions will eventually make the need for some data collection activities moot but listing data will still be the exception. So I’d like to see apps that make it easier to collect listing/property data and dump it into a database. I’m not sure that agents would use them, though. I was working on one, but after a few discussions with agents, they’re just not that interested. Collecting data is “someone else’s job.” And I have to say, I’m often amazed at how little some agents know about the properties they’ve listed – or how some don’t even bother to verify an address. So a second part of this wish is that, like it or not, CRE agents need to acknowledge that they're the data collectors for their listings and take the responsibility more seriously. 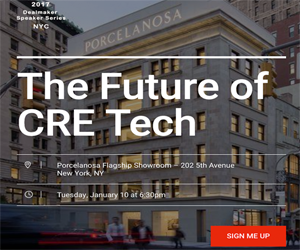 Newer PostBo Barron: What does 2013 have in store for CRE?